Author(s): Kavisha Arora, Anjaparavanda P. Naren. Division of Pulmonary Medicine, Department of Pediatrics, 3333 Burnet Avenue, Cincinnati Children‘s Hospital Medical Center, Cincinnati, OH 45229, USA. In the late 1980s, a loss-of-function mutation in the gene encoding for the cystic fibrosis transmembrane conductance regulator (CFTR) chloride channel was identified to be the primary cause of cystic fibrosis (CF); a fatal multiple-organ disorder that mostly affects Caucasians. To date, approximately 2000 genetic mutations have been identified in the CFTR gene (http://www.genet.sickkids.on.ca/cftr/app). The most common cause of morbidity and mortality in persons with CF is a progressive deterioration in lung function leading ultimately to respiratory collapse. The median life expectancy of CF patients currently is estimated to be 39 years in the US. The most prevalent CFTR mutation, F508del, accounts for 70% of CF cases and causes a processing defect in the protein leading to premature endoplasmic reticulum-associated degradation (ERAD) and reduced F508del-CFTR delivery to the cell surface. A CF corrector is defined as a chemical chaperone that increases cell-surface levels of F508del-CFTR. A series of CF correctors have been developed, and VX-809 (lumacaftor) has been cited as the most effective symptomatic CF corrector to date. VX-809 improves the function of the mutant protein by approximately 15% in in vitro culture systems. However, this effect did not completely translate clinically, with only a marginal improvement observed in lung function of the F508del-homozygous patients undergoing the therapy. New studies revealed that even after successful ER retrieval, rescued F508del-CFTR (rF508del-CFTR) once at the cell surface does not function properly, exhibiting poor stability and channel gating and structural abnormalities. This becomes further complicated by the existence of genes termed CFTR modifiers, which can alter CFTR function to be additionally defective and exacerbate the CF phenotype while also alternatively suggested be potentially targeted to improve F508del-CFTR functional outcome. 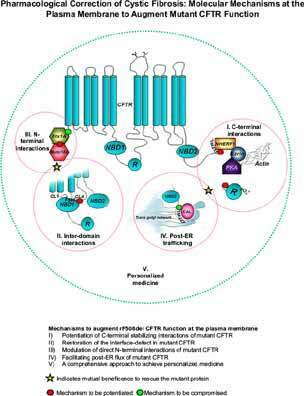 It is necessary to understand the biology of F508del-CFTR post-ER and at the plasma membrane where the protein might also confront the modifiers and how we can incorporate these components into CF therapeutics. Additionally, the notion that CF individuals would eventually benefit from more of a personalized medicine is becoming increasingly accepted. Here, we review how CF therapeutics may be simplified by understanding the complexities of rescued F508del-CFTR biology and eventually move toward more personalized medicine for patients suffering with CF. Keywords: Cystic fibrosis, F508del CFTR, F508del CFTR correction, CFTR macromolecular complexes, personalized medicine. Affiliation:Division of Pulmonary Medicine, Department of Pediatrics, 3333 Burnet Avenue, Cincinnati Children‘s Hospital Medical Center, Cincinnati, OH 45229, USA. Keywords:Cystic fibrosis, F508del CFTR, F508del CFTR correction, CFTR macromolecular complexes, personalized medicine. Abstract:In the late 1980s, a loss-of-function mutation in the gene encoding for the cystic fibrosis transmembrane conductance regulator (CFTR) chloride channel was identified to be the primary cause of cystic fibrosis (CF); a fatal multiple-organ disorder that mostly affects Caucasians. To date, approximately 2000 genetic mutations have been identified in the CFTR gene (http://www.genet.sickkids.on.ca/cftr/app). The most common cause of morbidity and mortality in persons with CF is a progressive deterioration in lung function leading ultimately to respiratory collapse. The median life expectancy of CF patients currently is estimated to be 39 years in the US. The most prevalent CFTR mutation, F508del, accounts for 70% of CF cases and causes a processing defect in the protein leading to premature endoplasmic reticulum-associated degradation (ERAD) and reduced F508del-CFTR delivery to the cell surface. A CF corrector is defined as a chemical chaperone that increases cell-surface levels of F508del-CFTR. A series of CF correctors have been developed, and VX-809 (lumacaftor) has been cited as the most effective symptomatic CF corrector to date. VX-809 improves the function of the mutant protein by approximately 15% in in vitro culture systems. However, this effect did not completely translate clinically, with only a marginal improvement observed in lung function of the F508del-homozygous patients undergoing the therapy. New studies revealed that even after successful ER retrieval, rescued F508del-CFTR (rF508del-CFTR) once at the cell surface does not function properly, exhibiting poor stability and channel gating and structural abnormalities. This becomes further complicated by the existence of genes termed CFTR modifiers, which can alter CFTR function to be additionally defective and exacerbate the CF phenotype while also alternatively suggested be potentially targeted to improve F508del-CFTR functional outcome. It is necessary to understand the biology of F508del-CFTR post-ER and at the plasma membrane where the protein might also confront the modifiers and how we can incorporate these components into CF therapeutics. Additionally, the notion that CF individuals would eventually benefit from more of a personalized medicine is becoming increasingly accepted. Here, we review how CF therapeutics may be simplified by understanding the complexities of rescued F508del-CFTR biology and eventually move toward more personalized medicine for patients suffering with CF.